The 2015 TT ZERO electric motorcycle race is coming up — the electric companion race to all the gas bike racing during the famous Isle of Man Tourist Trophy week. A new face is having a go at the TT ZERO, Victory Motorcycles, a subsidiary of Polaris Industries. Polaris recently bought out Brammo Motorcycles’ assets, and it shouldn’t be surprising that the Victory bikes bear a strong resemblence to the Brammo Empulse RR. 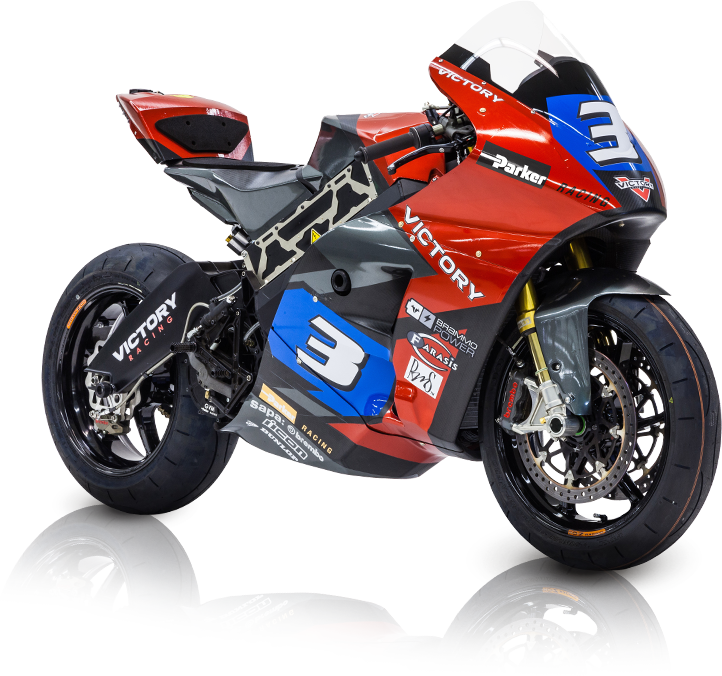 Victory Motorcycles described their 2015 TT ZERO bikes as a “Victory electric race prototype motorcycle”, and that they’ve hired William Dunlop and Lee Johnston. Both are top racers on the TT circuit and elsewhere. 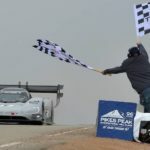 The press release doesn’t say much other than how everyone involved is excited to be making history — it’s the first time Victory is racing in Europe, with an electric bike. Victory Motorcycles did post a video interview with Lee Johnston. 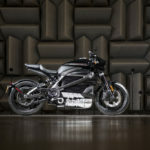 But, while the Brammo Empulse RR is not mentioned in the press release, nor in the video, nor in any of the press coverage, the pictures of the bike makes it clear that’s what they’re bringing to the TT ZERO. And as we’ll see in a minute, while a significant redesign has been done, Brammo staff (specifically, Brammo Power) is deeply involved. What’s clear from the news coverage is that they’ve done much more than just slap a new fairing and paint design on the 2013/14 Empulse RR’s. These are redesigned bikes with new motors, controllers, subframe and battery systems. Brammo would have done the same — they were always tweaking things of this sort. The “20 percent more capacity” is surely because they’ve chosen a different sort of battery cell than is used for other races. Other teams I’ve talked with use “energy cells” for TT ZERO and “power cells” for shorter races like we had in TTXGP events. A pack built with energy cells holds more usable energy (on Gas2.org, they say the bikes will carry 17 kiloWatt-hour packs ) than would a pack built with power cells. 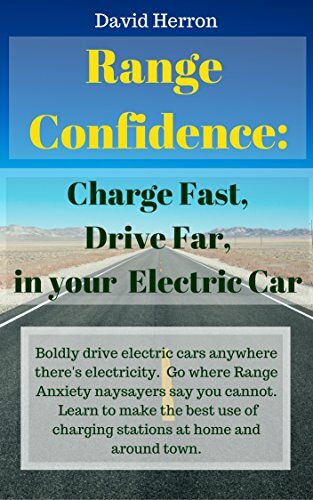 The cost of using energy cells is lower peak power output. 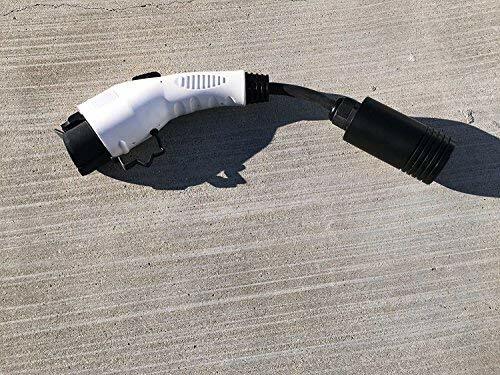 To put it another way, an energy cell pack will hold more kiloWatt-hours of energy (the bike can go farther) while a power cell pack can produce more kiloWatts of instantaneous power (the bike can go faster). CycleWorld said they’d also changed out the subframe, using a new carbon fiber monocoque sub-frame. And it’s clear from the pictures they’re using a whole new outer skin that looks to be more aerodynamic. In other words – new frame, new motor, new controller, new battery system, new outer skin, new brand name on the shell, it’s a whole new bike, yes? Why am I calling this an Empulse RR in disguise? Maybe it’s not, there’s only so much I can tell from 10,000 miles away looking at pictures. 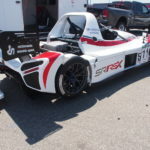 But let’s take a look at the 2013 Empulse RR’s as they were at that years eRoadRacing event at Laguna Seca. It’s clear that what Polaris/Victory is bringing to the Isle of Man is an evolution of the same design concepts developed by Brammo in the Empulse RR. There’s some differences, but Brammo was known to make significant changes even within a season. 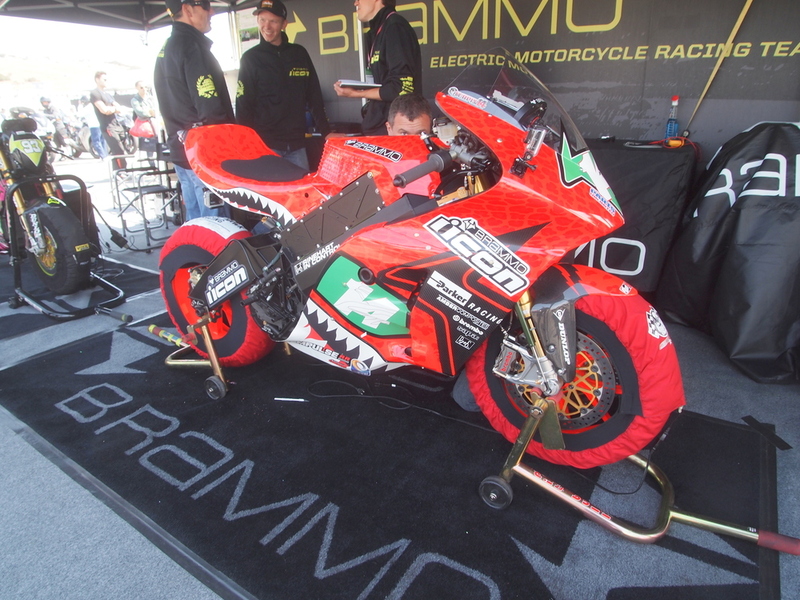 For example, during the 2012 season Brammo and Parker developed a new motor ahead of the 2012 TTXGP/e-Power Laguna Seca event, and the 2012 REFUEL event gave them an opportunity to test that combo ahead of the real race. Another piece of data is that, back in April Lee Johnston was at Thunderhill Raceway with the Brammo crew testing the new bikes . That test event is the subject of the video released a week ago, but Johnston tweeted a selfie in April showing him at Thunderhill (Brammo’s usual test track) with the Brammo crew. 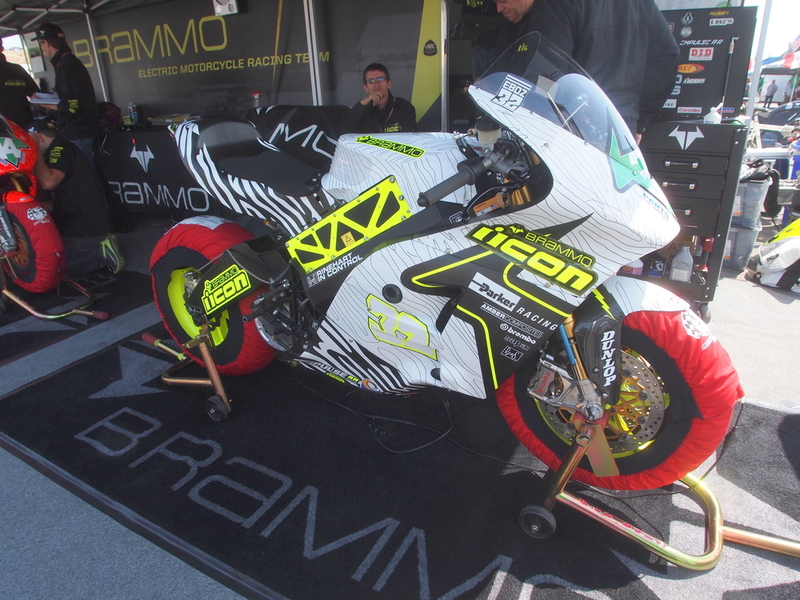 Hence, the testing occurred on Brammo’s home turf, in the same portable race paddock Brammo has used since 2010, and Brammo engineers working on the bike. The TT ZERO is the successor race to the 2009 TTXGP I wrote about the other day. It’s run on the same Snaefell Mountain Course on the Isle of Man as other TT Week races, but the TT ZERO is only a 1 lap race where the others go for more laps. This isn’t a regular race track race – the Mountain Course is a loop around the Isle of Man on the same roads as the locals use every day to get around. For several years the TT ZERO had seen a big competition between MotoCzysz and Mugen for prominence. Mugen is a well funded offshoot of Honda, and they spent millions of dollars each year developing the Mugen Shinden race bike. MotoCzysz, by contrast, was funded on a shoestring but managed to beat Mugen every year. Unfortunately, due to illness, MotoCzysz bowed out of the competition in 2014 leaving Mugen as the top dog. It’s ever so possible that Victory Motorcycles could give Mugen a run for their money. We’ll know in about a week and a half how this latest iteration of the Empulse RR’s stack up against the Mugen Shinden. You can learn more at the Victory Motorcycles website . 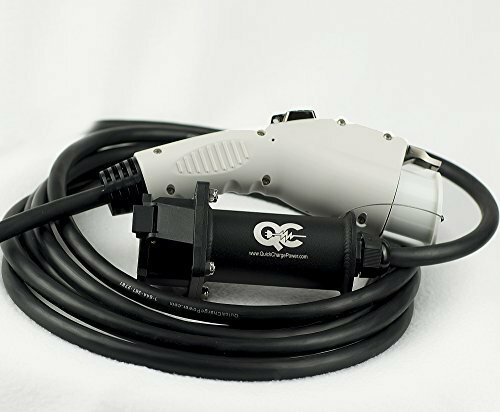 Brammo, Electric Motorcycles, Electric Racing, TT ZERO, Victory Motorcycles. Bookmark. 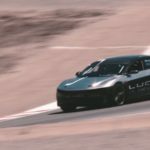 The TTXGP Electric Motorcycle Racing series is dead, why is it still important?